If the thought of leftovers leaves you feeling cold, we’ve got some ideas that will warm you up. We’re talking leftover curtain tracks, of course, which you might have if you only needed 10 feet of a track that came in a 12 foot section. Unfortunately we cannot accept returns of remnant curtain track pieces, but over the years our customers have thought of many unique and creative ways to use these unused pieces of curtain track. Repurposing is all the rage and why should your leftover curtain track feel left out? Considering our curtain tracks can be hung anywhere, including walls, ceilings, mantles, under cabinets, in garages, on deck railings, along the eaves of the house, etc., the possibilities for creatively using unused pieces of track are endless. However, you will need some accessories and drapery hardware to help, so don’t forget to buy your rollers, clips, etc., for the entire piece of track. After you have the extra track cut off, and your original project finished, it’s time to start letting the creative juices flow. An obvious first choice is to use the track to hang Holiday lights and decorations both in and out of doors. 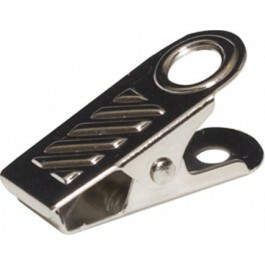 Our stainless steel J hooks are great for this as they are tough, sturdy, and can stand up to the elements. Too obvious, you say? Then make yourself the envy of every Pinterest minded repurpose-er by being the first to use your track to make a hanging memo board. You can hang the track by your desk and use our bulldog clips or metal clips with rings to hang up invitations, reminders, school permission slips, or your week’s shopping list. Don’t discount the usefulness of old-fashioned shower curtain rings for things like hanging ties or belts to help de-clutter your closet. We want to know how you are creatively using your leftovers! Share your unused track ideas and photos with us at info@curtain-tracks.com.